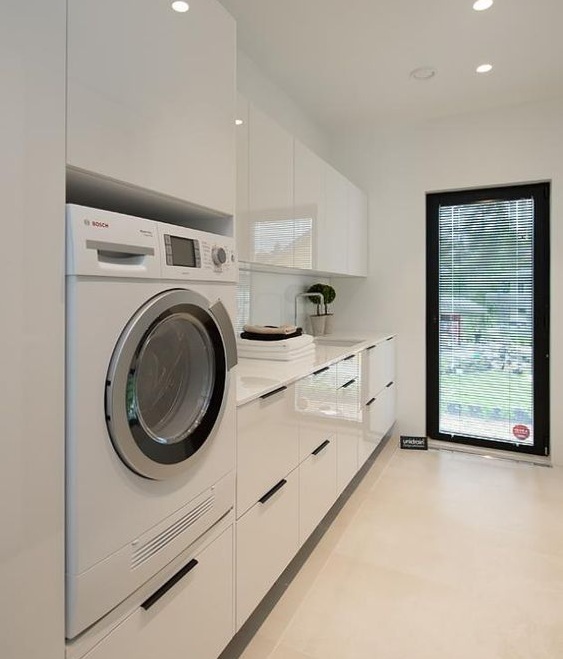 The laundry is just an extra room, but its design is as important as the others. Doing your laundry takes an average of 3 hours and 23 minutes a week, according to the Australian Bureau of Statistics. It’s a short span of time, but a lot of people still hesitate to wash their own dirty clothes. They have lots of reasons, but they don’t want to do it mainly because it’s a painful chore. Working in a laundry room with poor ergonomics strains your back and hip muscles. It gives you a terrible back pain sometimes. We are taller on average today so the (old) standard 900mm bench height might not work for all of us. Consider raising your bench height up to 920mm to improve the ergonomics. The additional height will enhance people’s posture and will help avoid back pain. Designers can extend the bench height up to 1000mm., in case they work for a homeowner who is long-legged and taller than average. You don’t need to crouch uncomfortably when loading and unloading the washers if you elevate it. From the floor level, raise the front loaders until the drum is 750-1000mm high. 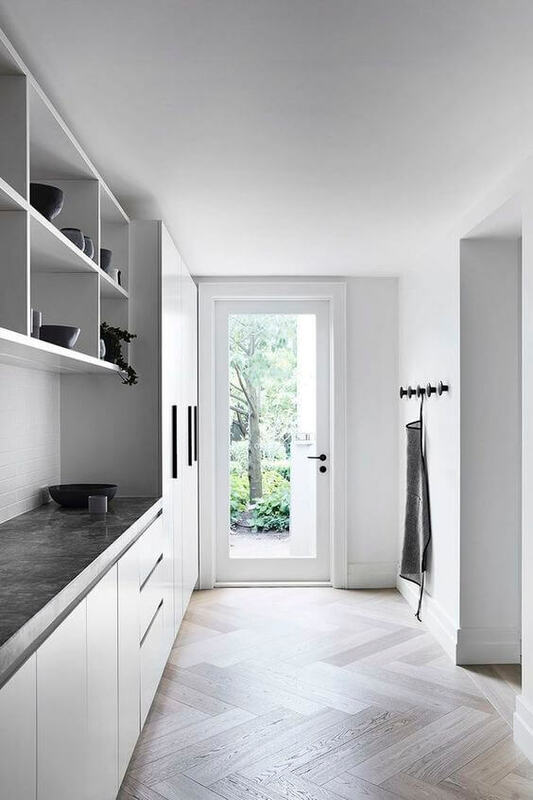 Consider integrating the appliances into a joinery for a more seamless look. If you’re buying a new front loader, choose a model with drums positioned higher in the machine’s body. Having more than one laundry hamper will help you separate the white, bright, and dark pieces of clothing before your wash day. Provide two to three baskets and label each one. This system orders everyone in your family to sort their dirty clothes themselves, so you don’t have to. It will save you time and you will avoid backaches due to bending too much. 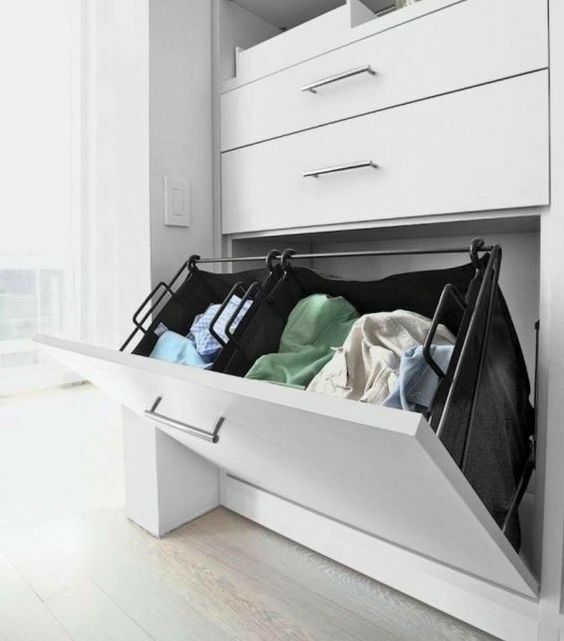 We like this laundry hamper that’s integrated into the cabinetry. The doors tilt out together with the removable bags. Other designs feature pull-outs with removable plastic baskets. It’s easier to open and access the contents of drawers compared to cupboards. Imagine yourself looking for the detergent and fabric conditioner in your laundry room. With more cabinets, you are forced to rummage uncomfortably up to the back of the cupboard. Drawers, on the other hand, will show you all of its contents in just one pull, therefore you can quickly find the items you need. Consider having drawers with various depths as it can help you organise your stuff. If there’s no room for custom drawers, consider shallow cabinets and open shelves for storage. Shallow cabinets are easier to access compared to the standard ones. Use pullable baskets and containers to organise the contents of the shelves. 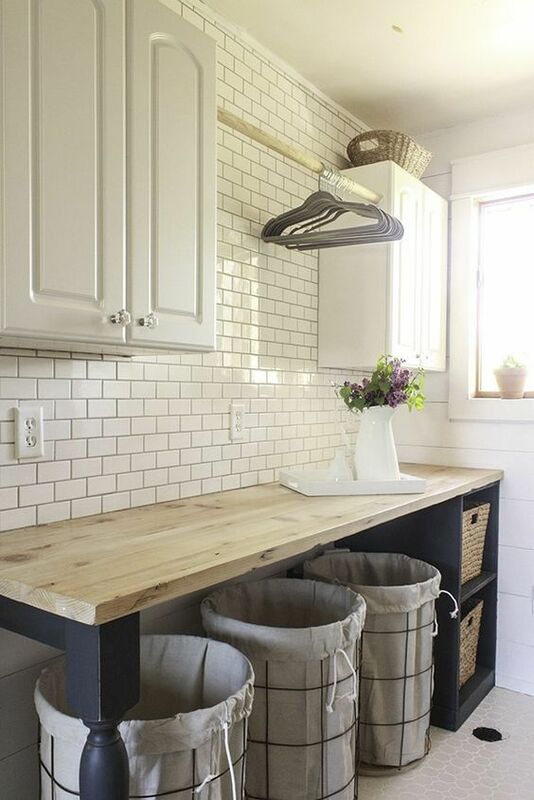 Choose a large, deep, and wide sink for your laundry. 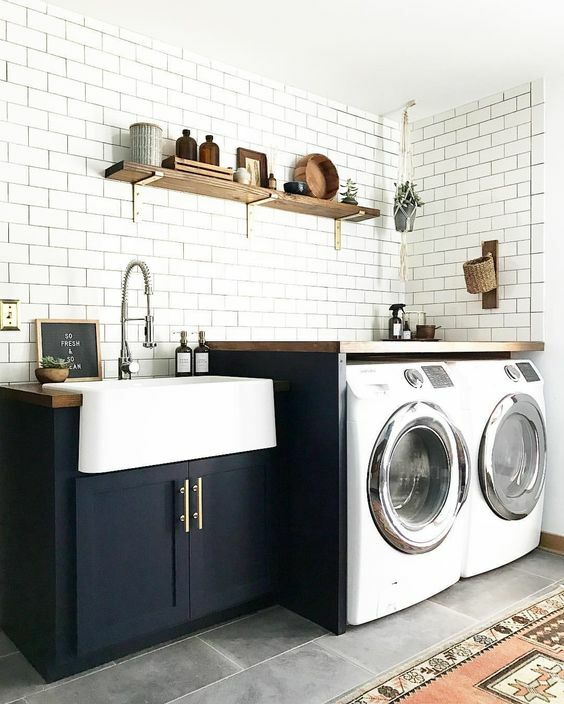 You need something for heavy-duty chores such as hand washing your clothes, bathing your pets, washing your household cleaning tools, and rinsing your garden tools. Next, install a tap with flexible hose and nozzle. It will help you control and direct the water when you need it. You need enough landing spaces near your workstations. 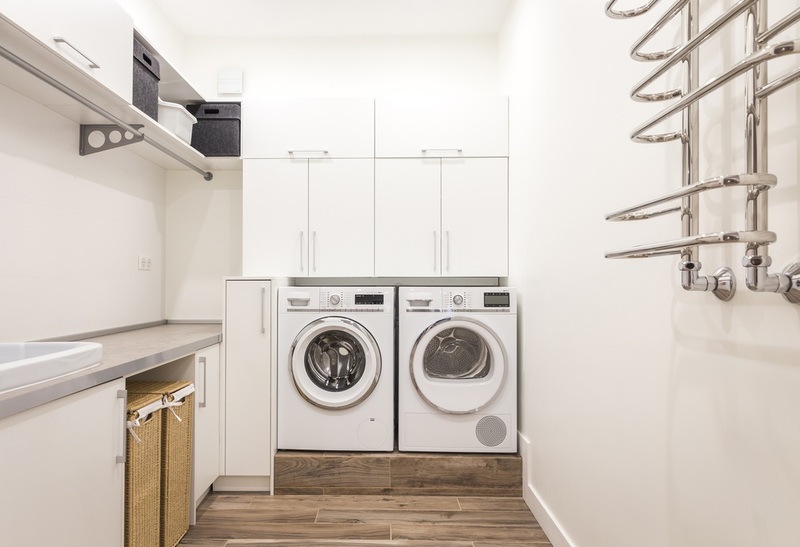 Your front loaders need ample floor space for loading dirty clothes and bench space for folding the clean ones. The same law applies to the sink—you need space beside it to rest the newly hand washed clothes. 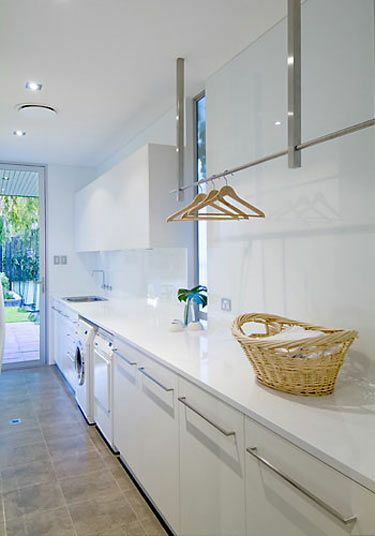 Include a door in your laundry which leads to your outdoor space so the sun and wind can dry your clothes for you. Ironing boards that are integrated into the joinery are more stable compared to the thin and wobbly portable ones. It is effortless to store and offers a streamlined look when not in use. It’s a hassle to carry heavy laundry baskets from one floor to another. 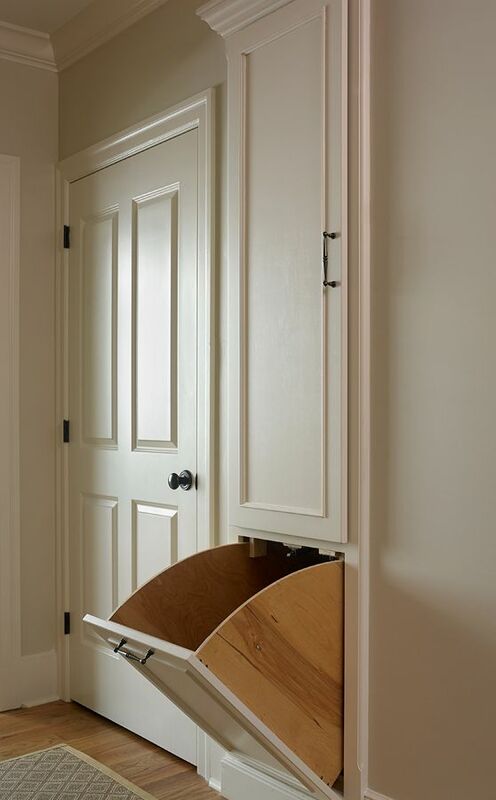 If your bedrooms, bathroom, and laundry aren’t on the same floor, then a flimsy laundry chute is a convenient addition. Linen chutes are lightweight alternatives to heavy laundry baskets. You can also connect multiple laundry shoots upstairs to the laundry downstairs through a system of tubes. This contraption will make your laundry a breeze. You save you a lot of time and effort as you don’t have to crouch to get the dirty clothes and carry it all downstairs. 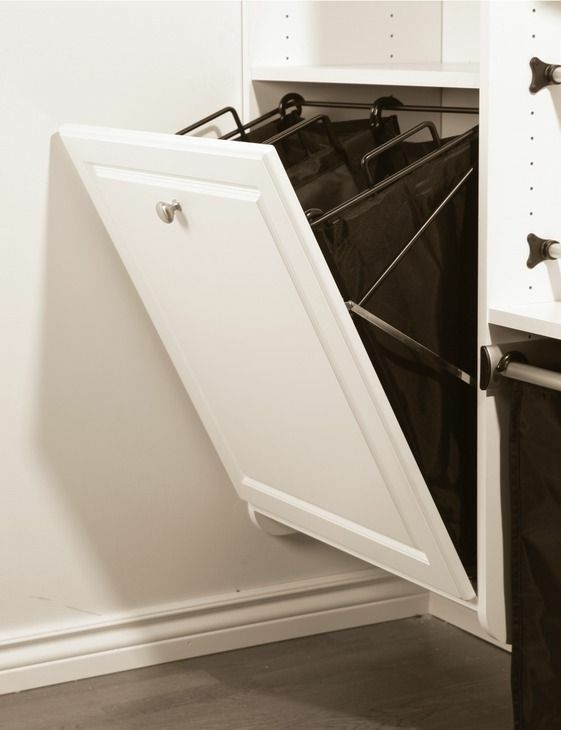 Make your laundry area more functional through adding dedicated storage for your household cleaning items. 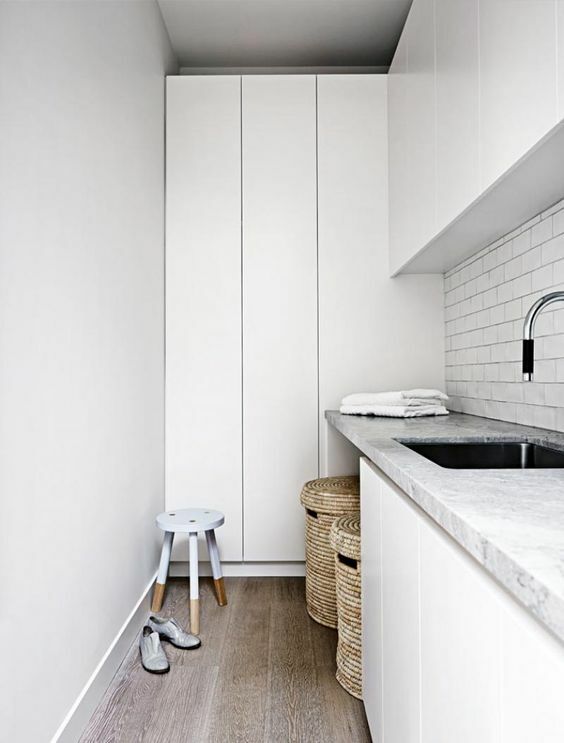 Have a good combination of deep and shallow drawers, tall and short cupboards, hooks for hanging, and parking space. Organise and store your mops, brooms, vacuum cleaners, gardening tools, and sporting gears here. Find a Melbourne architect & designer for this project.